Nam Thean Tong Temple ('cave of the southern sky') in the limestone hills of Ipoh. The temple was founded in 1867 by a Taoist priest by the name of Kuong San Teik, whose descendants run the temple to this day (Cheah 2009). The upper floors are made of timber and supported by trusses. A wooden toilet greets visitors to the left of the entrance. 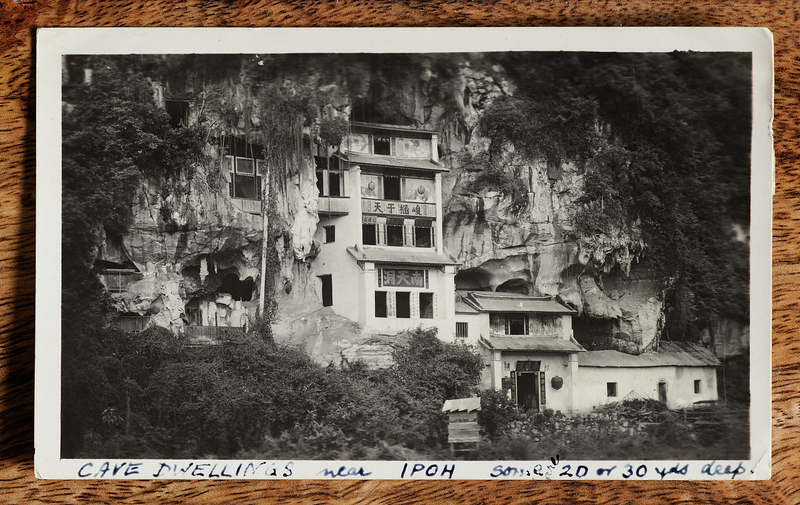 On the reverse of the card, a couple write about their enjoyable road trip from Singapore to Penang and back, presumably passing Ipoh which lies on the railway line from Singapore to Butterworth. Sultan Yussuf Izzuddin Shah ibni Al-marhum Sultan Abdul Jalil Karamatullah Nasiruddin Mukhataram Shah Radziallah (1890—1963), wearing the tall white tengkolok of the Sultan of Perak. The sultan was engraved in a unique way. While all the other faces are contoured using more-or-less horizontal lines, his face has lines sloping steeply down the cheeks. It could have been a spurt of creativity, or simply a means to balance out the height of the sultan’s headdress. Or could there be a deeper story behind this? The Crown Agents, Philatelic and Security Printing Archive at the British Library holds an uncleared progressive die proof of an unapproved alternative portrait, in which the lines go horizontally across the face. Did someone—a supervisor, a Crown Agent, or even the sultan himself—intervene? The sultan saved the life of the famous communist “grenade girl” Lee Meng. Lee Meng, who headed the Malayan Communist Party's courier network, was tracked down and captured in Ipoh by an equally shrewd female police officer through a convoluted chain of communist agents from Singapore to Johore to Jerantut to Kuala Lumpur and finally Ipoh. She was sentenced to death in 1953, but news of her conviction spread to London, where lawyers wrote a petition to the sultan to spare her life. 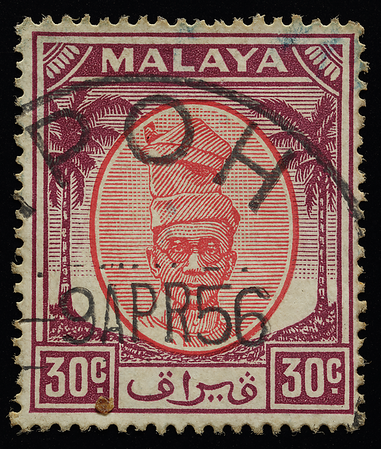 The sultan suffered a stroke in 1962 and died not long after. The girl he pardoned was freed in 1963 and sent back to China, where she married a fellow guerrilla she had met in the jungles of Malaya. The engravers seemed to have exercised considerable artistic liberty back then, when the authorities were less obsessed with conformity and standardization. 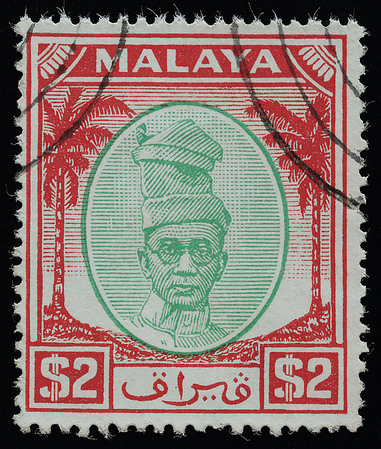 Unique features of the Perak issues include the “aura” created by the dotted background lines in the vicinity of the tengkolok, and the striking three-dimensional relief produced by the generous gap between the medallion’s rim and contents. 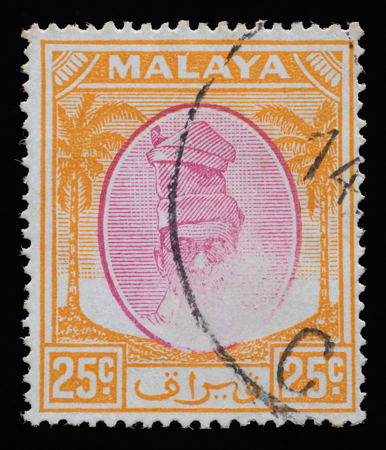 The sultan's face itself is engraved in a unique way not seen in any other, with lines sloping steeply down the cheeks giving him an austere countenance. It could have been a stroke of creativity, or an simply an attempt to counteract the excessive height of the sultan's headdress. 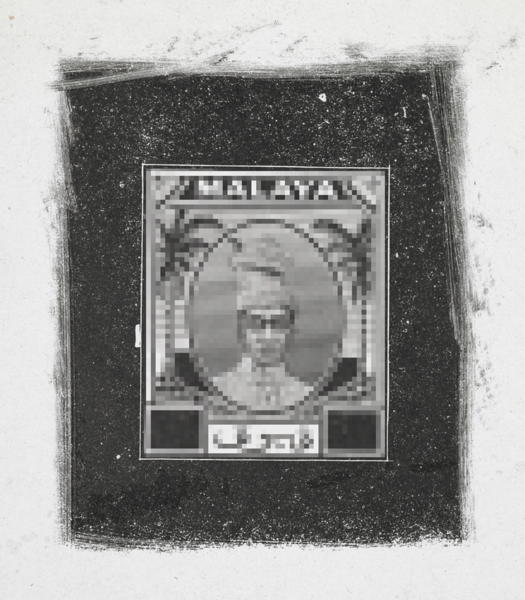 An uncleared progressive die proof on chalky paper exists showing the unapproved alternative portrait of the sultan. This has lower contrast, looks less authoritative with horizontal lines instead of the sloping lines described above, and features a funny pockmarked lower lip. The author commissioned for his private collection a high-resolution photographic reproduction (pixellated because of copyright) of the original proof in the Crown Agents, Philatelic and Security Printing Archive held at the British Library. A rare 'dry print' showing a blank patch where the ink might have dried or the inked key plate been touched by accident just before printing. 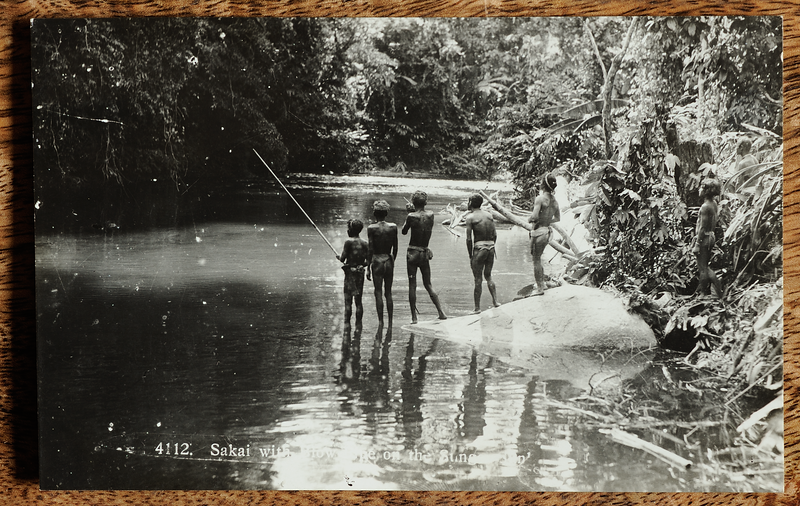 The orang asli ('aboriginal people'), incorrectly referred to by the derogatory term sakai ('inferior' in Malay), hunting along the Sungei Sungkei in the tropical jungles of Perak using blowpipes made of bamboo. The sap of the Ipoh tree (Antiaris toxicaria), after which the state capital of Perak was named, is mixed and heated with that of plants of the genus Strychnos, which contain indole alkaloids, to make the poison for the blowpipe darts. The orang asli are by no means inferior to latter-day urban dwellers in their ability to live off the jungle without destroying it. 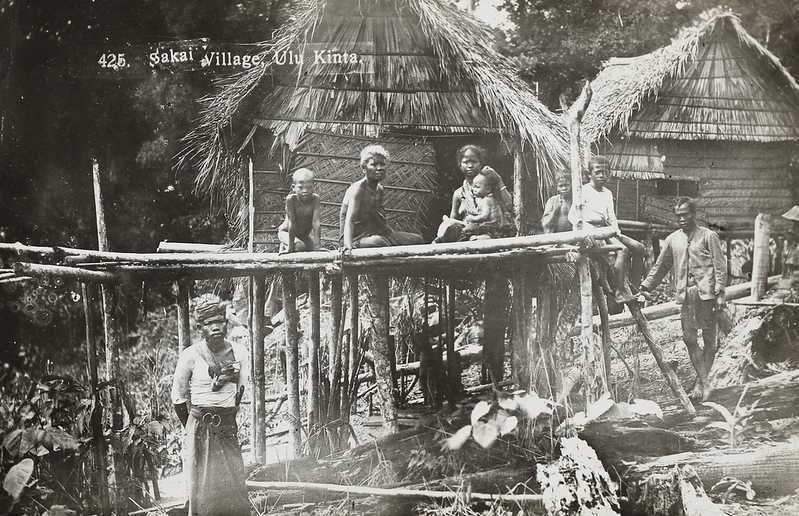 Orang asli village in Ulu Kinta, Perak. Kampong life in Perak has survived into the 21st century, such as in the case of Madam Ong Ah Lee, who continues to make a traditional Chinese delicacy from home-brewed rice wine and free-ranging chickens fed on a diet that includes dried coconut fibres mixed with boiled rice.